Dark District is coming to Ipad, Ipod Toch and Iphone today from developer Kabam. Dark District offers players a unique sci-fi thriller strategy title on the move. The free to play title is looking to recreate some of the success Kabam have been having from similar games across their many supported platforms. Dark District is available now via the Apple App Store. December 12, 2013 – San Francisco, Calif., – Kabam, the leader in the western world for free-to-play core games, today announced the launch of Dark District for iPhone, iPad and iPod touch, with an Android release coming soon on Google Play. 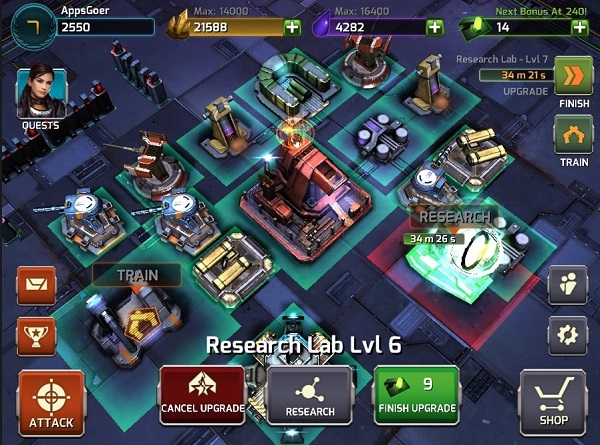 A science fiction-themed combat strategy game, Dark District raises the bar of the tower defense genre by putting players in full control of their mechs during battle in a visually stunning 3D world. • Strategic live assaults: Command fully controllable mechs, ground and air vehicles with the ability to change approach mid-action. • Experience the future in stunning 3D: The cityscape of this post-apocalyptic future has never looked so good. • Band together to be victorious: Form an alliance with other players to seize power against other factions. A strategic partnership can raise individuals to the top of the leaderboards. • Merciless single and multiplayer combat: Select PvE single mode to progress through campaigns or PvP multiplayer mode to attack live districts. The Dark District App is available for free from the App Store on iPhone, iPad and iPod touch . For more information visit www.kabam.com.